"Nobody likes change… To me it doesn't matter how a fighter look, it ain't going to knock me down." R3M Pictures has debuted an official trailer for a boxing drama titled Tiger, the latest from Australian filmmaker Alister Grierson (Sanctum, Kokoda: 39th Battalion). A practicing Sikh is banned by the boxing commission for refusing to back down from his religious beliefs. Through racial profiling and stereotypical threats, he does what any strong American would do, fight back - in the courts, and in the ring. The film stars Prem Singh as Pardeep Nagra, and the cast includes Mickey Rourke, Janel Parrish, Marshall Manesh, and Michael 'Mick' Harrity. This looks alright, but I'm not too sure. It seems like a meaningful story about someone fighting for what he loves to do, fighting against age old racism and prejudice. Check it out below. 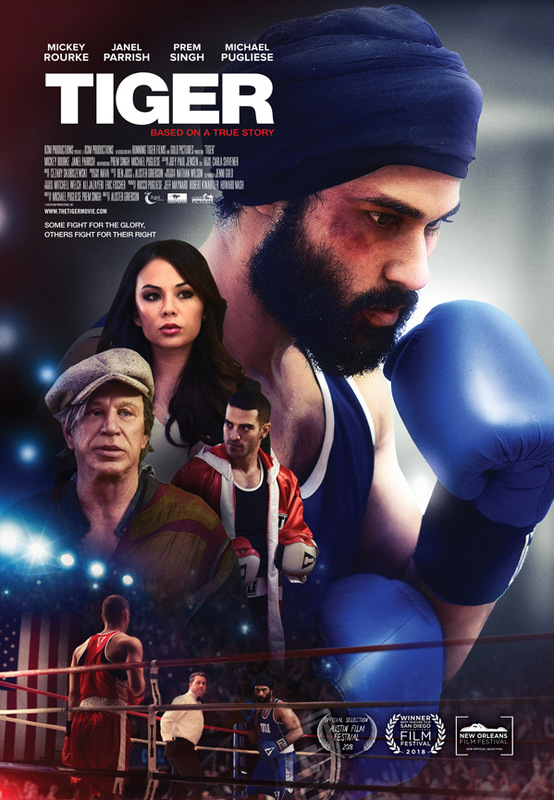 A practicing Sikh boxer (Prem Singh) is banned by the commission for refusing to back down from his beliefs. Through racial profiling and stereotypical threats, he does what any strong American would do, fight back. As a consequence, his legacy is forever tied to his two biggest battles: one in the courtroom, the other in the ring. Tiger is directed by Australian filmmaker Alister Grierson, of the films Sanctum and Kokoda: 39th Battalion previously, as well as a number of short films. The screenplay is written by Michael Pugliese and Prem Singh. This will premiere at the San Diego Film Festival later this month. R3M Pictures will then release Grierson's Tiger in select theaters + on VOD starting November 2nd this fall. Interested?